Why Didn’t Kalon Tripa Read Out Tapey’s Name? On January 4, at the end of the fourth day of the Kalachakra teachings, the newly elected Tibetan Prime Minister, Kalon Tripa, gave a speech. I would like to thank him for talking about the tragic cases of self-immolation that have occurred inside Tibet, I would like to thank him for reading out all the names and ages of those who have died from or been injured by self-immolation. The sorrowful expression on the face of His Holiness the Dalai Lama made everyone feel very moved and emotional. But on this relatively important occasion, Kalon Tripa failed to mention the first case of self-immolation that happened inside Tibet in 2009; his list of names was missing the first person - Tapey. With regards to this, I want to ask Kalon Tripa, why did he fail to do so? Is it because Kalon Tripa did not know of this person? Last year at the end of November he was visiting Europe, giving accounts of the situation in Tibet and when he presented the number of self-immolations in Tibet, he missed out that one. 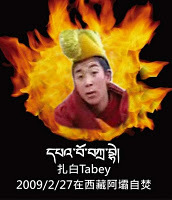 At the time, I reminded people on my blog and on Facebook that the first case of self-immolation happened on February 27, 2009 and that the affected person was the 20-year-old Tapey from Kirti Monastery in Ngaba Prefecture, Amdo. Please do not ignore his sacrifice. When he was in flames, he was shot and crippled by the Party’s military police forces, to the present day no one knows of his whereabouts, no one knows whether he is still alive; please do not forget Tapey! At the time, a fellow Tibetan from outside Tibet told me via the internet that he had already passed on my point to Kalon Tripa who then indicated that he did already know, which comforted me, making me believe that our Kalon Tripa would amend his wording; after all, he had said himself that the Tibetans self-immolating “are not just numbers” but that each and every one represents human life. 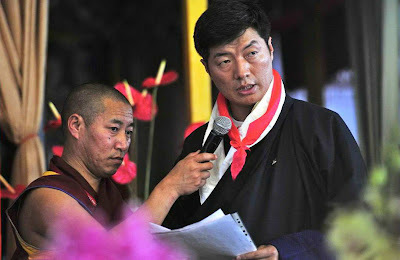 However, what disappointed people was that Kalon Tripa, despite being aware of his previous mistake, on this recent important Buddhist gathering, when reading out the names of the people involved in self-immolation, only read out those that had happened in 2011. This was a clever move because in this way, he could still ignore Tapey’s name without having to be worried about being accused of shortcomings; indeed, with regards to the number of self-immolations in 2011, he did not present any wrong numbers. However, by doing so, isn’t he making an issue out of numbers? Isn’t he precisely turning our fellow Tibetans who died from or were injured by self-immolation into mere numbers? What I want to ask is, why does Kalon Tripa insist on eliminating the first person who self-immolated from the list? Didn’t Tapey sacrifice his life for Tibet? Wasn’t Tapey the very first out of no fewer than 15 cases of self-immolations that had occurred inside Tibet by the beginning of 2012? Didn’t Tapey’s parents, fellow villagers and monks eagerly wait and wish for Kalon Tripa to read out Tapey’s name at the Kalachakra teachings hosted by His Holiness the Dalai Lama, to give him his deserved recognition, respect and prayers? For Kalon Tripa to read out Tapey’s name and age, it would only have been a matter of moving his lips up and down a few more times and his relatives in Tibet would in this way have seen the value of Tapey’s sacrifice and felt the deepest gratification. But why, why would our Kalon Tripa begrudge those few extra words and make the relatives and fellow villagers and monks feel that Tapey has been forgotten? I am thinking that the only plausible reason for this is that Tapey’s case already lies three years behind and may no longer need to be mentioned. Yet, must time be a reason for removing memories and cancelling commemorations? If a hero who sacrificed himself at immense cost three years ago need not be mentioned, what about the many martyrs that over half a century ago sacrificed themselves for our people, can they all be regarded as having already vanished like smoke in thin air and thus need not be remembered? Perhaps Kalon Tripa wants to use time as the marker to draw up statistics about the cases of self-immolation; does that mean that from now on, we only give out information like this: since the beginning of 2012 there have already been three cases of self-immolation in Tibet and there is no need to mention the 12 cases of 2011? Of course, wouldn’t there be even less need to mention those of 2009? In view of this, if our Kalon Tripa still does not to talk about Tapey, well, I am sorry, I will continue to raise my voice until the facts have been restored. At the same time, we also have to remember that among the Tibetans living outside Tibet, in 1998, the 60-year-old Thupten Ngodup sacrificed himself through self-immolation in Delhi, India; moreover, in November last year, in Kathmandu, Nepal and New Delhi, India, the monk Butuk and the layman Sherab Tsedor were injured through self-immolation.